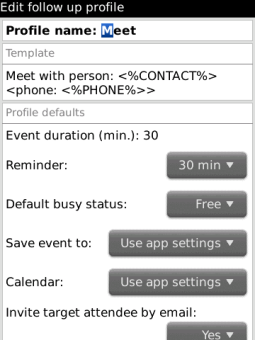 Set your BlackBerry to schedule appointments and return calls with one hand. FollowUp Reminder makes your BlackBerry device even handier by letting you use it on the go while taking your current schedule and your contacts’ time zone and working hours into account. This ergonomic call-back reminder makes it possible to schedule follow-up calls with just one hand. Use FollowUp Reminder in busy environments, on the go to schedule appointments and phone calls according to your schedule. FollowUp Reminder will take care of your contacts’ working hours and time zone completely automatically, determining an appropriate time to call by their phone number country/area code. The user interface of FollowUp Reminder is utterly simple and non-distractive, allowing the tool to be used with just one hand. You don’t need to know what time zone that area code is, or calculate the time difference. 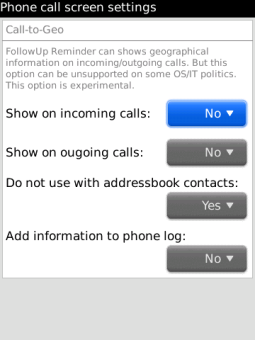 FollowUp Reminder can be used safely anywhere on the globe to call anyone in the world. FollowUp Reminder will take your time zone and time zone of the other party into account, making sure you only call during established business hours or some other time that’s best to reach that party. The perfect time to call can be determined automatically based on your location and your contact’s phone number, country and area code. You’re on a schedule. Your contacts are on a schedule as well, and maybe in a different time zone. With FollowUp Reminder, you’ll never have to worry about missed calls or overlapping events. The call-back reminder will be placed into a free slot on your schedule, and aligned to take your contact’s time zone and available hours into account. Best time to call can be specified for all contacts to make sure you’re not catching them off-guard. Bagi dong activation code’a 2B01C589 ? Very obliged if you can give the activation code.